Copy Cat version of the famous dish served at the Killer Shrimp Restaurant in Marina del Rey. Spicy and rich broth with shrimp swimming happily. Using a mortar and pestle, smash the rosemary, thyme, pepper, celery seed, fennel seed and pepper flakes enough that they remain whole but are broken to more easily release flavor. Add spices, broth, garlic, clam juice and tomato paste into the Pressure Cooker cooking pot. Lock on lid and close Pressure Valve. Cook at High Pressure for 10 minutes. Open lid and stir in beer and the optional cup you reserved from the prior batch. Select Sauté/Browning on your Pressure Cooker and allow broth to come to a simmer, about 7 minutes. Add butter and allow to melt. Add shrimp and stir until shrimp are no longer translucent. 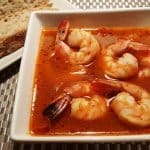 Ladle shrimp and broth into bowls and serve with plenty of sliced crusty bread, for soaking up the delicious broth. Serve with a fresh and hot Country Sourdough Batard or French Bread. If this is the first time making this recipe, reserve a cup of the liquid and use it on your next batch and then freeze a cup from the next batch and so on and so on. This will intensify the flavor and make each batch better.